Nina Ottosson started the Zoo Active Products AB in 1993, with development and design of dog-activating toys and games for dogs and dog-owners, which is to mentally activate the dog in a positive and educational manner. Nina Ottosson Dog Twister is an exciting and activating game for you and your active dog. The dog is to look for treats by moving one block after another in a circle in different directions; the blocks can also be locked in position by a bone-shaped peg on the up-side of the game. There are depressions under the blocks where treats can be hidden. The idea of the Dog Twister is for you and your dog to have an enjoyable and fun time together. The dog is to learn to look for treats by moving one block after another around in a circle in different directions. There are hollows under the blocks where treats can be hidden. The blocks can also be locked in position with pegs in holes around the up-side of the game. The dog is to learn to lift these pegs in order to be able to move the blocks and find the treats. Teach the dog words like: wait, go ahead, go back, find it, sit etc. while you are playing. Enriches your relationship with your dog. You show. The dog/cat looks, listens and learns. Give praise when it does the right thing. Together you will have fun! Use The first time you place treats in all the hollows. Let the dog be present and watch. Place the blocks so that some treats can be seen between some blocks. Tell the dog to 'go ahead' and allow the dog to try and find the treats by itself. If the dog does not understand, point with your finger to a treat in a hollow. Praise the dog immediately when it does things right. When the dog has understood what to do you can hide a different number of treats each round, and it depends on the dog how many rounds you manage to do in a certain time. If the dog tries to bite the game or the pieces, then put your hand over it and stop the game. When the dog has calmed down you can tell it to go ahead and let the dog try again. If the dog repeatedly wants to bite, then teach it to work only with its paws. If the dog rather wants to throw itself on the game and beat excessively with its paw, then teach it to work with its nose by putting the game on a stool/chair which is adapted to the size of the dog. This is also useful if the dog has an injured paw or if it has just had an operation. Increase the degree of difficulty By locking the blocks with bone-shaped pegs which are to be placed in the hollows all around the up-side of the game. The dog is to learn to unplug the blocks by lifting the pegs one by one in order to be able to move the blocks and then find the treats. You can also hide treats under all the pegs. Start by locking some of the blocks. Later when the dog has understood how to work, you can lock all the blocks. 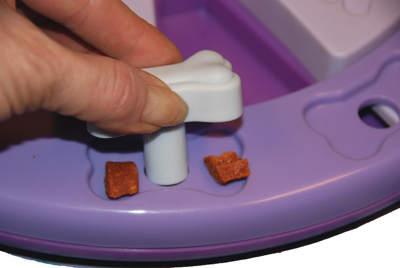 The pegs can also be placed sideways in order to make it easier for the dog to get hold of them. Tips Mix some meaty dog food with water, pour some of the mixture in the hollows, put the game in the freezer and let it set. This is perfect for hot days or when the dog needs some extra activity. Note: only under strict supervision. Important Do not let the dog/cat chew or bite the toy. Only play the game together with the dog/cat, do not leave the dog/cat without supervision. The dog/cat must not play or chew the chips/parts. Put the game away when you have finished playing. Only meant for animals. It is not a toy for children. Suitable for dogs and cats of all ages and sizes. Easy to clean and also suitable for cats.